I’m not kidding. I was a tub trying to fit into a tub. 195 pounds! When I think of it now, it’s a wonder our trailer wasn’t flooded daily. You see, my family and I live in a mobile home in Marietta, Georgia. And you can’t imagine what a squeeze that can be unless you’ve been fat and tried to move around a compact trailer. Especially when your husband weighs over 200 pounds himself. Each time we tried to pass, one of us had to back up, or step aside. My weight problem was nothing new to me. I was twelve pounds at birth, and by the time I’d reached eighth grade, I’d eaten myself up to 180 pounds. Mashed potatoes, fried chicken, candy, cake, pies – I loved them all. I’ll never forget going to a swim party when I was in high school. One of the boys yelled, “Hey Jeannie, you look like and elephant in a mouse suit.” I wanted to die. After graduation, I took up practical nursing. While in training the doctors all went to work on me to reduce. They even prescribed reducing pills, but these only set me on my ear. I was a nervous wreck most of the time. And as soon as I’d lose fifteen pounds, I’d weaken and eat double what I did before. Was my life dull! No dates. No shape. No fun. Only food. I finally decided to join the Navy and see the world. But it was easier said than done. The fact was I was too fat. I needed to lose at least 40 pounds. I’d tried all sorts of diets, liquids, pills, and willpower. What was I to try next? A crazy crash diet of baloney and dry bread. I ate this for breakfast, lunch and dinner, day after day, until I lost enough to be accepted. Soon after boot camp, however, I began to gain again. But I had a whole year before my next physical, so I didn’t care. Fortunately, I married and left the Navy before the problem presented itself. But my poor husband! He got me on the slim side, but wound up with quite an armful. Particularly after our two lovely daughters were born. They’re just a year apart, and believe me, there was a lot of fat in between. My clothes looked like battleship covers. And my stockings were the biggest I could buy. You see, my thighs were tremendous. And just walking caused such chafing, I continually had blisters on the inside of my legs. At 195 pounds, I not only was ashamed of myself, but ashamed for my husband. But what was I to do? The radio gave me an answer. I had heard Arthur Godfrey talking about a reducing-plan candy made to help you curb your appetite. It was called Ayds and it contained vitamins and minerals. No harmful drugs. Somehow it sounded right for me, especially when he said eating Ayds was like eating candy before meals. It spoiled your appetite. Next time I went to the drugstore, I bought a box of the chewy vanilla caramel Ayds. Later, I tried both the fudgy chocolate mint kind and the plain chocolate fudge type. Well, I started taking one or two Ayds as directed, with a hot drink, three times a day. And it really helped me to eat less. Why, I was able to cut out most of the bread I used to stuff on. And I even passed up desserts without feeling sorry for myself. I followed the Ayds Plan one whole winter. Ten pounds came off. Twenty. Thirty. Each month, I took my dresses in more and more, until seam met seam. In the spring, when I began hanging out my wash, without a coat on, my neighbors hardly knew me. 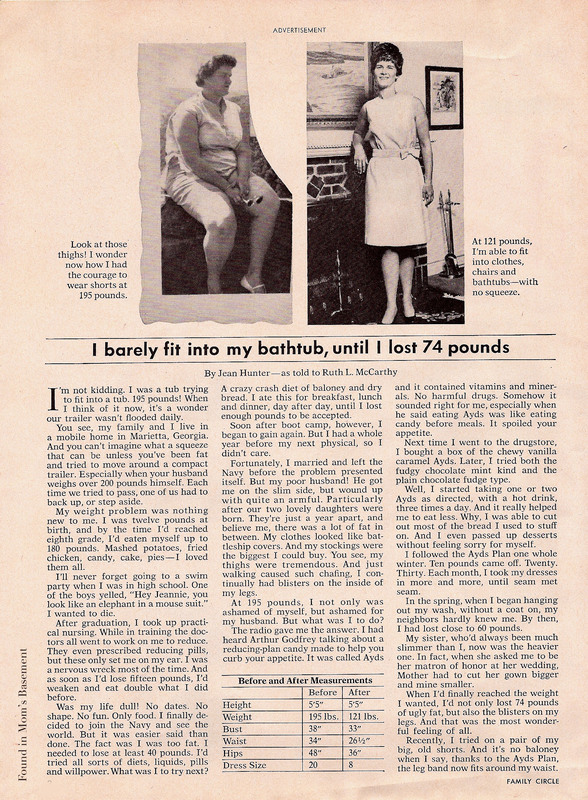 By then, I had lost close to 60 pounds. My sister, who’d always been much slimmer than I, now was the heavier one. In fact, when she asked me to be her matron of honor at her wedding, Mother had to cut her gown bigger and mine smaller. 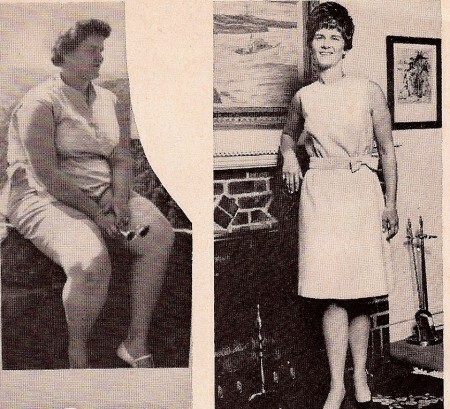 When I’d finally reached the weight I wanted, I’d not only lost 74 pounds of ugly fat, but also the blisters on my legs. And that was the most wonderful feeling of all. Recently, I tried on a pair of my big, old shorts. And it’s no baloney when I say, thanks to the Ayds Plan, the leg band now fits around my waist. Yeah, they do all have that. There was a madtv scetch once about “eat less and move more.” And this whiny person saying that was too complicated and couldn’t they just take a pill or have surgery? And the guy responds, “you’d rather have dangerous, invasive surgery than just eat less and move more?? ?” That one always sticks with me as I’m trying to do this on my own. OMG, I remember those AYDS candies so well! I used them when I was about 15 or 16. And they actually did work – at first, like most of these quick weight-loss scams. The problem is, the candies tasted so good I wound up eating the whole box! It took me @35 years of yo-yo-dieting and scams before I discovered what Mom always told me – “eat right and exercise”!